What Should I Post On My Fanpage? I myself have come to a Facebook page quite often and thought, “what do I say?” and I do this everyday for many businesses. This week’s infographic shows what kind of information you should be posting on Facebook, and how often. With that in mind, I wanted to help you come up with ideas to post. What Should I Post on My Facebook Page Each Day? So here are some ideas I have about what to post and what platform it will work on. Morning everyone, how’s the weather in your area of the world? Time to share: My favorite non-profit cause is______. Who is someone you’ve always wanted to meet, and why? Mine is …. Do you have pets? Are they like your children? My favorite movie trilogy is_____. If I were alone on a desert island, I would want this book ___. Tip- When I can’t think of anything to post I like to use Fanpage Robot to see if they have anything I can share with my followers. A lot of time I can find an interesting trendy topic on my dashboard, and click share. 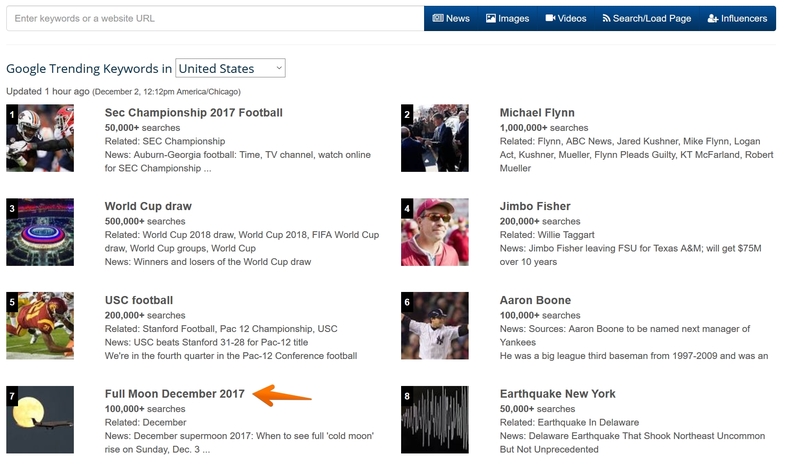 After I click “Full Moon December 2017”, it gives me a list of news articles that I can share with my audience. Click on a post, and add something else you want to talk about with your followers. You should definitely update your fanpage everyday, I recommend doing it a few times a day. It will get much easier when you are used to signing in daily and you get used to chatting with your followers.